There are those who are infected by nostalgia and yearn for a nineteenth-century Mormonism because, I suppose, they imagine that the prophets then seemed more willing to condemn capitalism or to preach environmental stewardship and that Mormons were more communitarian, less materialistic, and more obligated under the law of consecration to work to eliminate poverty. And there are others who are disgusted with the wickedness of this world and pine for the world to come, a time when poverty, crime, wickedness, injustice and inequality will finally be done away with because our hearts will finally be knit as one. In either case, it seems that the assumption is that the gospel in its full force is not operable in the present. 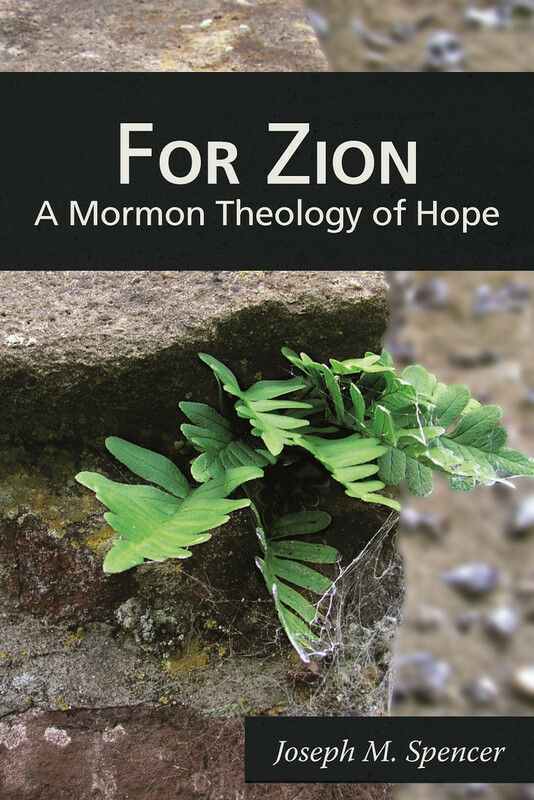 What Joseph Spencer’s book, For Zion: A Mormon Theology of Hope (Greg Kofford Books 2014) makes evidently clear is that neither assumption is entirely correct, or at least neither is very useful for us in the present. They may, in fact, be ways in which we train ourselves to avoid the obligations and hard work of building Zion here and now. As he writes, “We displace the force of the law of consecration into the irretrievable past or the indefinite future precisely so that we do not have to take up the difficult work the law prescribes for us right now” (145). And what is that work? Hope seems like a fragile thing, really, especially in light of the enormity of our tasks. While we hold tightly to our things in the hope that we can worry about fairness later, Spencer teaches a harder and truer doctrine of hope. Hope is what rises in the face of the seemingly impossible, not that which denies reality. The impossible, he goes so far to say, is the “bread and butter” of hope. It might be true that we cannot stop poverty or suffering or environmental waste, least of all individually, but our charge is to live in the hope of the world’s transformation and such hope must begin by facing up to the facts of our impact on others and on the earth and by assuming responsibility. If repentance is an honest acknowledgement of failure in the past, it is also a hopeful turn to live better in the present, what Spencer describes as “full trust in the word of promise (147). In other words, what Spencer’s book drives home is the invaluable insight that our hope in the future transformation of the world is made most evident in our loving answerability for its present circumstances. I read that and immediately thought of Derrida’s “Force of Law.” Whether one takes the law of consecration as a law in the sense Derrida means or more in line with what Derrida calls justice is an interesting question. As is the place of violence (broadly speaking – micro aggressions not excluded) in all of this. We are stewards, but what does that mean as we act? This relationship between violence (inherent in the force part of law) is always difficult. If waste is itself violence, as you and Spencer suggest, what does that mean? Likewise, the reduction of “every grace of the earth to an image” again recalls Derrida. What is the relationship of law (the image, the representation, the force) to justice (the origin, the grace)? I think there is something more tricky here than it appears. I’m not intimately aware of the the entire thesis, but so far as I’m familiar, I disagree with one of the underlying points made in regards to the earth’s diminishing resources. That is to say, I believe that the premise for finite resources is overplayed far too much. We really aren’t running out of resources! Meanwhile, poorer nations of the earth are becoming wealthier precisely because wealthier nations buy their goods and services from them. The oil America buys, for example, is often a crucial source of revenue to those living in poverty. If America were to suddenly burn less oil, the impoverished would suffer the worst. I am emphathetic towards a charitable attitude. We should be charitable wherever possible and encourage this in others. Focusing on the disparaty between the rich and poor (which is almost always utilizes the zero sum fallacy, with the erroneous idea that the rich become rich by stealing from the poor) rarely gives us any meaningful solutions to the problem.